Several dozen spectators gathered at Cameron and Spring streets in downtown Silver Spring yesterday to watch construction workers hoist a pedestrian skybridge into place at the headquarters of pharmaceutical company United Therapeutics. Friend of JUTP/freelance photographer Chip Py and I were there to capture the scene. CEO Dr. Martine Rothblatt founded United Therapeutics in 1996 to find a cure for her daughter, who was suffering from pulmonary arterial hypertension, a disease that creates difficulty in breathing. The publicly-held company, which has over 500 employees, licenses, markets and will eventually produce three drugs that improve blood flow around the heart. The bridge will connect two of the three buildings in UniTher's headquarters, which was designed by Schick Goldstein Architects of Chevy Chase and first opened in 2006. Altogether, the nearly-finished $32 million complex contains UniTher's corporate offices, research labs, and production facilities, along with several currently unoccupied retail spaces and two pocket parks. Rendering of UniTher's completed headquarters courtesy of the Montgomery County Planning Department. The steel-frame bridge was delivered on Tuesday to Cameron Street on the back of a flatbed truck. Construction workers I talked to said they were originally going to spend the past week attaching glass panels to the bridge before raising it, but decided against doing so because of the added weight. At 11am Sunday morning, the crew began preparing to lift the bridge as a crowd of about 40 people formed on both sides of temporary barriers placed around the construction site. People brought their children, set up tables and chairs, and raised their cameras high, forming the dorkiest tailgate party ever. 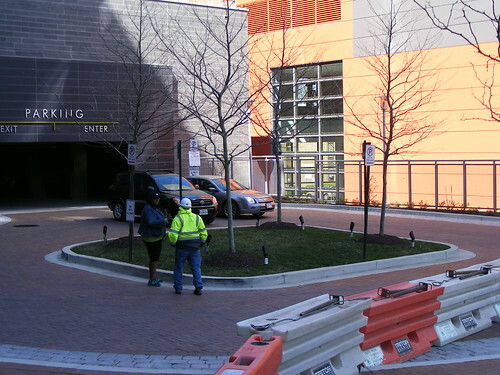 One Good Samaritan United Therapeutics provided coffee and donuts in the morning for spectators and construction workers alike; at lunchtime, they had several Papa John's pizzas delivered to the site. 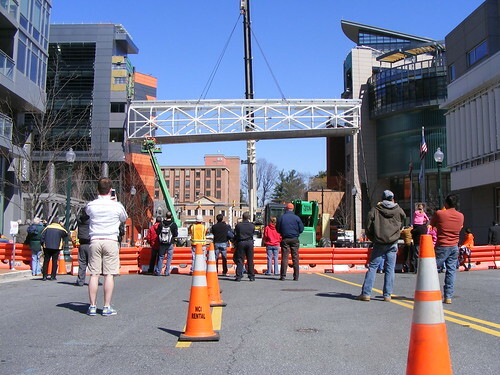 By 12:30pm, the bridge was in the air, slowly being raised into place by a crane. Raising the bridge into place. Video by Chip Py. Those lucky enough to have a higher perspective of the action took advantage. A small group of United Therapeutics employees gathered on the roof of their headquarters, while residents of the Cameron, a recently-built apartment building across the street, watched from their balconies. Not everyone was excited about the construction. Cameron Street has been closed to through traffic since Tuesday, and residents driving in or out of the Cameron's parking garage grumbled as a police officer moved barriers and traffic cones aside to let them pass. The street was shut down entirely while the bridge was being hoisted into place, and one resident who couldn't leave the garage angrily confronted a construction worker. A woman living in the Cameron argues with a construction worker after learning she can't drive out of her building. "It's Sunday, and people have to work!" she yelled. "This is unacceptable! Nobody told us it would be like this." A police officer intervened, trying to calm the woman down, but was persistent, demanding to have the name of everyone's supervisors as she walked back into her building. After an hour, the bridge was almost in place. A few construction workers in a cherry picker assisted the crane operator, giving him specific directions to shift the bridge over a few inches at a time. 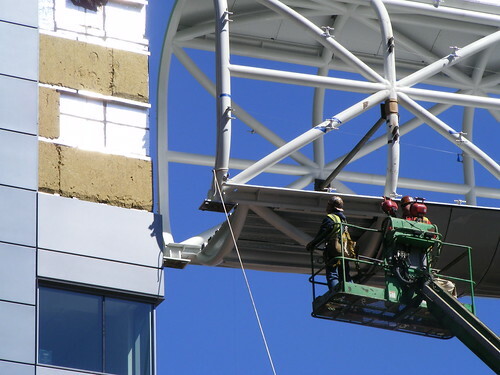 When the bridge is exactly where it has to be, the crew will fasten it to each building. As I've written before, the UniTher headquarters is a great addition to downtown Silver Spring. The complex will not only save lives and provide jobs, but it offers retail space for local businesses and two well-crafted public spaces for everyone to enjoy. On top of all that, the buildings just look cool. Hopefully, this project will encourage other companies locating in Montgomery County to follow suit. Check out this slideshow of the bridge being lifted into place. Also, click here to see Chip's photos. It is curious that this bridge is pedestrian bridge is so celebrated but there is so much opposition to a pedestrian bridge to the new library. I guess pedestrian bridges are OK if they are not open to the general public. The library bridge situation is completely different, including the fact it'd be $800K+ of taxpayer money. I'm not a fan of any pedestrian bridges. What was the rationale behind this one? The only thing I could see is that it makes it easier for employees to securely walk between the two buildings. And by securely, I don't mean not getting bothered by cars. I would have preferred this had been an underground tunnel. Did United Therapeutics pay for the right to build over the street? After all they don't own that space. This isn't the same as the library bridge as this is a private company connecting two of their own buildings. I do not want my taxpaper money going towards skybridges and Silver Spring should try to stop anymore from going up and begin to take down the ones that are already here. Credit where it is due: United Therapeutics provided the coffee and donuts in the morning and pizza around lunch time for all the people watching the bridge go up. This bridge shows that a lot of the arguments used against the library bridge are bogus. The bridge adds considerably to the architectural interest of a group of already interesting buildings. 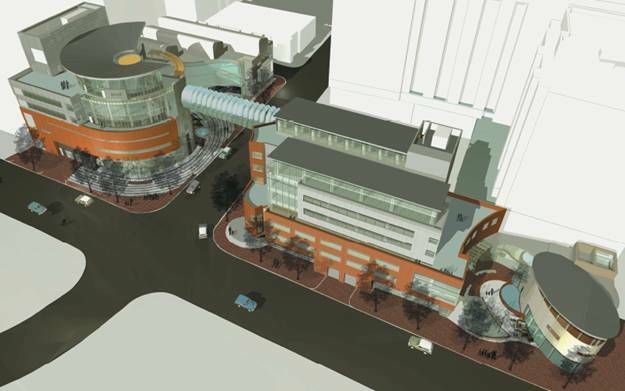 A library bridge would do the same, and would benefit the elderly, the handicapped, and people with small children who would be able to conveniently use the new downtown Silver Spring library rather than probably going to other more accessible libraries. The main reasoning I could think of for the pedestrian bridge at UniTher is that they manufacture pharmaceuticals there, which requires a certain level of security - and if they're shuttling chemicals from side of the bridge to the other, protection from the elements as well. And, as Jag said, they're paying for it themselves. Not that every company who opens in Silver Spring should be able to use that excuse to get a bridge, but it's a valid concern in this case. The main argument for the pedestrian bridge to the Silver Spring library is safety, not the protection of company secrets or pharmaceutical ingredients. Thus, you can improve the crossing at Wayne and Fenton - which, of course, benefits everyone who crosses the street there, not just those going to the library - and solve that problem. The only thing that's bogus, Robert, is the assumption that downtown Silver Spring streets are meant for pushing cars through, and that we have to get our pedestrians out of their way. And also, Robert, what library in Montgomery County is more "accessible" than one in a walkable neighborhood a few blocks from the second-largest transportation hub in the state of Maryland? Rockville and Bethesda, maybe. But if you're telling me that the Olney Library with its big parking lot but minimal bus service and almost no foot connections to surrounding neighborhoods, is more "accessible" than the Silver Spring library, then maybe you should ask someone who doesn't have a car. Habitrail bridges ... not just for hamsters! People like you are pushing for a weaker Silver Spring that doesn't take into account the people who actually live in the area. If you define accessible as the ability to drive somewhere and not have to walk on the street, I hope you go to another library, another town, another state. Anyone who actually lives in the DTSS area knows that a lot of handicap people live here because it is relatively easy to get around without a car. That's true accessibility. The other day I saw a blind woman walking to Giant with her resuable bags. Making the streets for cars only, as you propose, would eliminate her freedom. How do you justify that? Walking is accessibility and freedom. You want Silver Spring to be a car's only place where if you want to walk between buildings you need to walk on special bridges. Thanks but no thanks. You seek to ruin DTSS with your ignorance. It's great to see not only a Silver Spring based company do well, but that they stayed in Silver Spring. I agree, Terry! Especially with Choice Hotels moving from Silver Spring to Rockville next year. It's important that Silver Spring is seen as an attractive place for companies to do business, and UniTher's investment in a new headquarters here definitely helps. I will say that besides the skybridge, it's a nice looking building. I'm happy that they have chosen to stay her and invest in a nice looking building.